Dwayne Etter is looking for a few good bears – denned bears, that is. Now that it is winter he hopes to collar some. Black bears are moving into southern Michigan and Etter is tracking their whereabouts. “We had four GPS-collared bear (this past year) and now we have zero,” said Etter, who conducts black bear research for the Michigan Department of Natural Resources. “If people find bear dens south of U.S. Route 10 they can call us and let us know. Etter has been studying Michigan black bears, trying to learn more about their travel patterns and how they adapt to the southern Michigan landscape with its mixed forest and agricultural lands. That was the plan until his latest research subjects gave him the slip. Three of four bears managed to slip out of the collars. A fourth was found dead, but the cause has not yet been determined. Etter’s efforts last summer to trap bears for collaring were met with disappointment on a dozen occasions due to trap malfunctions and uncooperative bears. He’s hoping to get new leads from southern Michigan residents this winter and plans to continue the research if more bear can be collared. The GPS data proved invaluable, he said. When projected onto a map, it showed the precise routes each bear traveled, the type of terrain preferred, and where each settled in for the winter. Some of the findings came as a surprise. 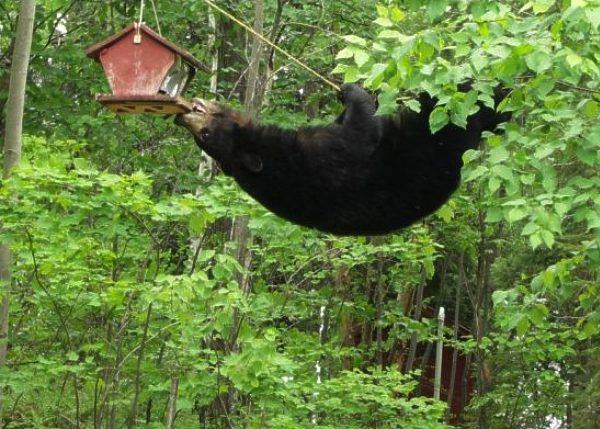 That finding, he said, has implications for just how many bears move into southern Michigan. Other GPS plots confirmed that females do not move a far as males. Etter theorizes that they have cubs in tow and stay closer to denning areas. Males, on the other hand, may travel far. GPS collar data showed that one denned bear near Whitehall traveled up the White River corridor in spring. It eventually crossed the Muskegon River and set up a home range just south of Houghton Lake – approximately 125 miles from the den. Etter suspects that bear had wandered south to Whitehall as yearling, denned for the winter and emerged in spring ready to mate then headed back north to find a female. Another male traveled 75 to 100 miles from Breckinridge, a Gratiot County village southwest of Midland, to Alpena County where it spent a couple of weeks before moving 50 miles south to Gladwin County where he was eventually killed by a hunter. Adam Bump, the DNR bear program leader said black bear increasingly are moving into southern Michigan. The “occupied range” now extends south of a line from Muskegon to Bay City. Most of those bears are found in western Michigan. Reports also come in from Saginaw and Ionia counties, among others, Bump said. He knows of one that denned under I-75 in Bay City, and of others that den near homes. Just how far or fast the bear population will expand into southern Michigan remains an open question. Etter points to GPS data showing a very strong preference for forested habitat rather than agricultural land. But he acknowledges that young bears born further south may not have a desire to head north to mate, nor the same habitat preferences. “They have the capability of adapting and some figure out how to move across the urban landscape,” Bump said. Etter suspects drought conditions resulted in a significant weight loss for two males that slipped their collars this year. Males generally are less likely to lose a collar. Females do more often because they are nursing a litter of cubs when they are collared in a den. They lose weight over the winter and are able to slip the collar off in spring when they come out of hibernation. This entry was posted in Uncategorized and tagged Bears, Black Bear, DNR, GPS Collars, Nature, Southern Michigan, Wildlife. Bookmark the permalink.